The cities of the Low Countries are a delight to experience. Beginning in the medieval masterpiece of Ghent, your Rick Steves guide will take you on story-filled walks through the hearts of Ghent, Bruges, Delft, and Amsterdam. You'll also visit a traditional Belgian brewery, thought-provoking Flanders Fields, a historic Dutch town, a high-tech sea barrier project, and the world's largest flower auction — ending in Amsterdam with the poignant Anne Frank House, and the brilliantly restored Rijksmuseum. Join us for the Heart of Belgium & Holland in 11 Days! Our adventure begins in medieval Ghent. We'll gather at our hotel at 4 p.m. for an introduction meeting. Then we'll hop aboard a fun and informative canal cruise through the city. Our evening ends with a traditional Belgian dinner together. Sleep in Ghent (2 nights). Boat: 1 hr. No bus. Walking: light. This morning we'll meet with a local expert for a walking tour of the historic center of Ghent. Together we will visit soaring St. Bavo's Cathedral, home to Van Eyck's sublime altarpiece, The Adoration of the Mystic Lamb, which was stolen and hidden by the Nazis during WWII. After lunch on your own, we will regroup for a guided tour of the Ghent Museum of Fine Arts, where we will get up close to works by Bosch, Rubens, Magritte, and Van Dyck. Your evening is free for more exploring at your leisure. No bus. Walking: strenuous. Today we'll meet our driver and board our bus for the short drive to the WWI battlefields around Ypres. Half a million soldiers were killed here, making it one of the deadliest — and today the most hallowed — stretches of land along the Western Front. With the aid of a local expert, we'll tour the monuments, visit a thought-provoking museum, and see "the fields where poppies grow." After lunch together, we're off to Bruges and our lovely canal-laced and ivy-draped hotel. After check in and some time to relax, we'll regroup for an orientation walk and dinner together. Sleep in Bruges (3 nights). Bus: 5 hrs. Walking: moderate. We'll meet our savvy local guide who will introduce us to the pedestrian-friendly streets and alleyways of Gothic Bruges, including a tour of the Memling Museum — showcasing several of Hans Memling's masterpieces all housed within one of Europe's oldest medieval hospitals. Our afternoon continues with a visit to a Bruges chocolatier, where we'll learn about the artistry and traditions of Belgium's most mouth-watering export. After a free afternoon, we'll regroup for a tour of Bruges' oldest brewery to learn about what makes Belgian beer famous around the globe and enjoy a taste ourselves. The remainder of the evening is free to find the perfect Belgian dinner. No bus. Walking: strenuous. Today is yours to explore Bruges. Armed with your Bruges Museum Pass, you'll have free entry to any four museums — including the masterpiece packed Groeninge Museum. You may decide to go on a culinary scavenger hunt tasting your way through a myriad of Belgian specialties. Or you can hop on a bike and take a wonderful hour-long ride along a tree-lined canal to the nearby small town of Damme. The choices today are endless. No bus. Walking: light to strenuous (your choice). Today we'll discover how a country stays dry when nearly half of its land is below sea level. Over centuries, the Dutch created an immense system of dams, barriers, and dikes for protection from the North Sea — the Deltaworks. We'll explore these feats of modern engineering culminating with a tour of one of earth's largest moving structures — the Maeslant storm surge barrier — and gain a better appreciation of the fragility of the Low Countries. We'll continue on to the traditional Dutch town of Delft for an orientation walk and dinner together. Sleep in Delft (2 nights). Bus: 5 hrs. Walking: light. This morning an in-depth walking tour with a local will give us a personal introduction to Vermeer's hometown including the massive Gothic New Church, where generations of the ruling House of Orange are buried and revered. We'll also visit a workshop to discover the qualities that make Delftware so dear. 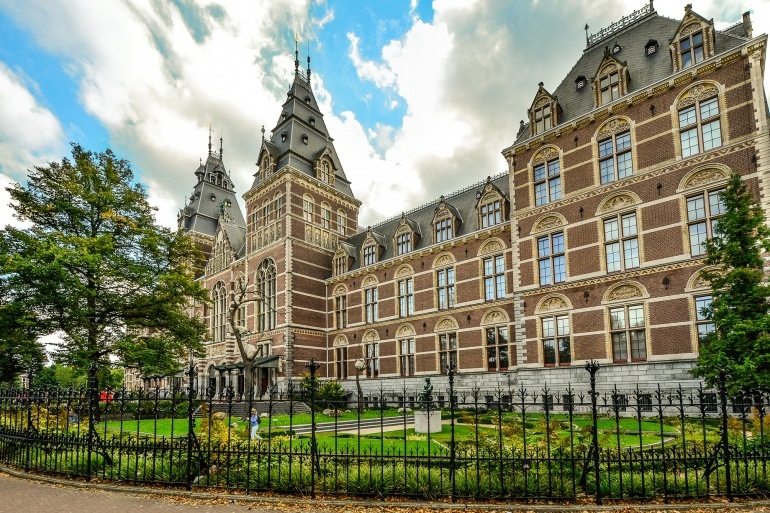 The rest of your day is free to explore the many other charms of Delft or take a short tram ride to The Hague, where you can get up close and personal with paintings by Rembrandt and Vermeer at the Mauritshuis, or travel back to an 1880 seaside at the Panorama Mesdag. No bus. Walking: light. We'll begin our day in Europe's biggest building — filled with acres of flowers — learning about the worldwide distribution of beauty that begins each day at the Aalsmeer Flower Auction. Then we'll stop for lunch and exploration in a historic Dutch town on our way into Amsterdam. Upon arrival, we'll take an orientation walk through the city and window-shop the Red Light District, learning about how the Netherlands regulates the world's oldest profession. We will end our day with a traditional rijsttafel dinner together. Sleep in Amsterdam (3 nights). Bus: 3 hrs. Walking: strenuous. This morning get chummy with this great city's gabled houses, bridges and canals learning why the Golden Age glimmered so brightly here. We'll take an historic walk through the heart of the city stopping to visit the Anne Frank House for a thought-provoking look at the hideaway of Anne and her family during the Nazi occupation of the Netherlands. We'll continue our lessons on Dutch tolerance stopping at a local "coffee shop" to learn about this nation's creative, pragmatic approach to drug policy. The rest of the day is yours to tackle any number of Amsterdam's wonderful museums. No bus. Walking: moderate. We'll start the day with a thrill: getting up-close and personal with Rembrandt and Vermeer on our tour of Amsterdam's remarkable Rijksmuseum. You can continue your encounter with artistic genius at the nearby Van Gogh Museum, home to 200 of Vincent's works or enjoy the nearby charm of Vondelpark. This evening we'll meet for our farewell dinner, where we'll share memories and toast new friends. Proost! No bus. Walking: moderate. Breakfast is provided, but there are no group activities today. Amsterdam's Schiphol Airport is an easy bus ride away. Your guide will help you with any post-tour planning, leaving you well prepared for the road ahead. Tot ziens!